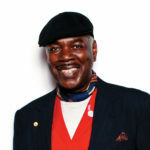 Frederick Weston has been a Visual AIDS artist member since 1998. Born in Memphis, Tenn., and raised in Detroit, Mich., Weston moved to New York to enter the world of art and fashion in the early 1970's. His work communicates the soul of a thoughtful man feeling his way through physical realities and representation in America. "A true artist," Frederick Weston says, "can be creative with whatever is available." Weston should know: He tends to find material and images for his art anywhere he looks, from stationery stores to photocopiers. That not only keeps down costs -- a nice practicality -- but also testifies to his belief that fine arts can be made of the spontaneous, the found, the everyday. It's a lesson he learned at his mama's knee. Born in Memphis, Tenn., and raised in Detroit, Mich., Weston grew up with adults who viewed the domestic arts as both business and pleasure: His mother was a gifted decorator and seamstress; his grandmother could make "anything she put her hands to better"; and his grandfather was a highly inventive tinker. A self-described "African-American man living an alternative lifestyle," Weston ultimately left the Midwest behind to seek out the bright lights in Manhattan, where he says he's "spent all his adult life working and playing." He went to school and entered the working world, but only to pay the bills: Art has always called to him, no matter what else he may have been doing. "I have never 'found' the time to do my art," he says. "I 'make' the time. I 'take' the time." Weston helped found the guerrilla artist group Underground Railroad, which produced street art and outdoor installations in the mid-1990s, as well as during the difficult period New York City lived through after the 9/11 terrorist attacks. "My art is my activism -- it exposes me as a person," he says. Weston's artwork tends to address crises of culture -- the commercial male image, fashion, consumerism, conservation and recycling. And, he adds, "I am sure if you look long and hard enough, you may see some references to the virus." However, although some of his paintings deal with his HIV-positive status, Weston says HIV doesn't overwhelm his work -- or his life. "It is just another coin in the pouch," he explains. "Sometime it comes out heads; it's a blessing. Sometimes it comes out tails; it's a curse. There are a lot of coins in my pouch." It's the idea of his "blackness" that resonates most profoundly throughout his work, Weston says. "The one thing I have never been able to get around is being black and male in this world," he says. "It colors my every dream." As it happens, Weston's mom at first dissuaded him from art "because I wouldn't make any money," Weston recalls. "I don't know that I can make a living as an artist," Weston admits, "but I do know that if I am not creating art, I am not living. Being able to create is real power." - Text from thebody.com "Visual AIDS - A Gallery of Art by HIV-Positive African Americans"